Fan static pressure is one of the two parameters that define the performance of a fan. The other, and more common, is the volume of air the fan delivers per minute or per hour. Fan static pressure is the resistance pressure the fan has to blow against to move air in the desired direction. 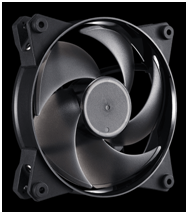 For PC gamers, high airflow and high-pressure static fans are two distinct classifications. High-pressure static fans are used on radiators, central processing unit (CPU) and graphic processing unit GPU coolers, in front of hard drives, and other places where airflow might otherwise be blocked by an object. Because of their high-pressure capability, they can overcome the restrictions caused by the blockage. The Masterfan Pro 120 Air Pressure Fan is ideal for funneling concentrated air short distances at hot components or through tight spaces. Image courtesy of Cooler Master. In wood drying operations, kiln static pressure is not a constant and depends upon the performance of the fan chosen. For example, replacing a small fan generating 45,000 cubic feet per minute (cfm) at an estimated pressure of 0.5 inches H2O in a kiln with a larger fan rated at 60,000 cfm at 0.5 inches of H2O will not achieve 60,000 cfm. The actual air flow will be less than 60,000 cfm due to the rise in the static pressure – a situation that can cause complications in the end application. In heating, ventilating and air conditioning (HVAC) systems, static pressure measures the effectiveness of the fan to the ducts in a particular installation. If the static pressure is too high, the HVAC unit will have to work harder to push the air through the duct work. In all of these low-pressure situations, an accurate microelectromechanical systems (MEMS) pressure sensor with a digital output, such as All Sensors DLLR Series, can address the manufacturing, installation verification or ongoing operation measurements. A liquid propane (LP) powered portable heater can make an enclosed space tolerable and even comfortable when the outdoor temperatures are low. Many systems use pressures in the range of 10 to 20 psi. However, these pressures can reduce the unit’s BTU output as the temperature drops. 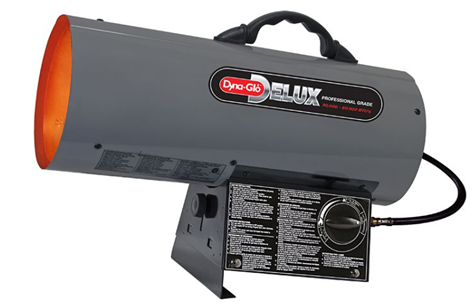 In contrast, a low-pressure portable heater system such as Dyna-Glo’s Delux 60,000-BTU Portable Forced Air Propane Heater can consistently achieve maximum BTU outputs, even in extremely cold environments. Operating at only 0.5 psi, the unit is also safer. Since the operating pressure is determined by design and not measured during operation, it does not have a pressure sensor. However, in the design verification or quality control processes, a pressure sensor such as All Sensors SPM 401 Series media isolated sensor could be used by manufacturers that make low pressure heaters as well as those that make high pressure heaters. Image courtesy of GHP Group, Inc.